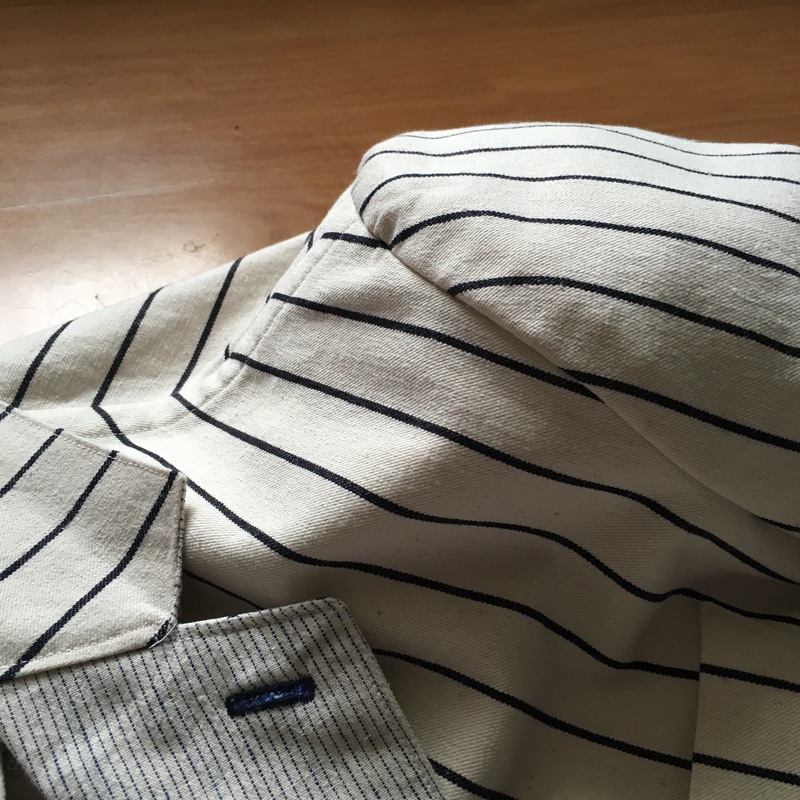 Hi, I wanted to try out my jacket pattern again. The last one was a big learning curve (read: Mistake!) I managed to not only choose the wrong fabric but also the wrong size. Undeterred, I decided to make another. 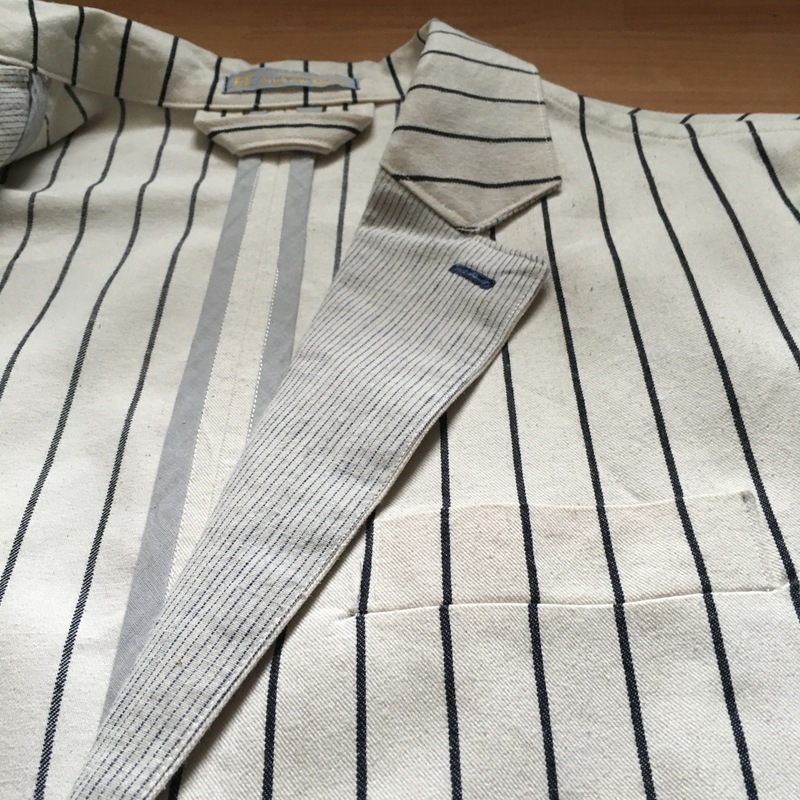 I used the same pattern, KwikSew K3485 (seduced by its apparent minimum hand sewing) and I had this lovely soft, buttery cotton twill (1″ white stripe, navy pinstripe) from the (seemingly bottomless) gift-stash from my friend LadyP. I traced out the smaller size, and went for it. I had already decided to abandon the lining for bias bound edges and a Hong Kong finish (I just love that name, Hong Kong finish. Brilliant). So I just had to put it together like the last one… But better. 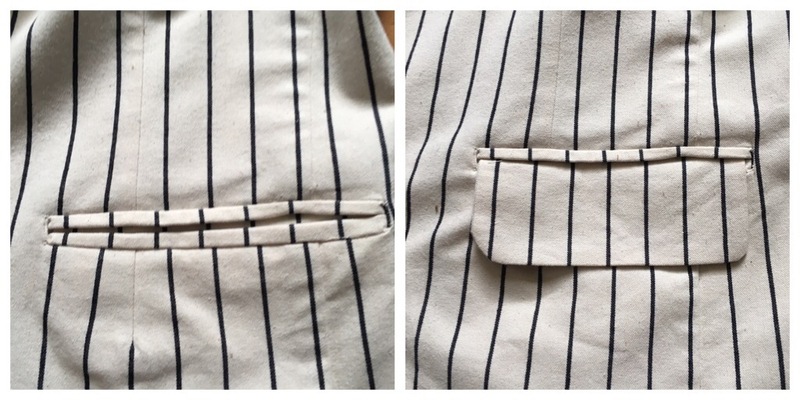 I keep meaning to try chain stitching the pockets down… But life’s too short! 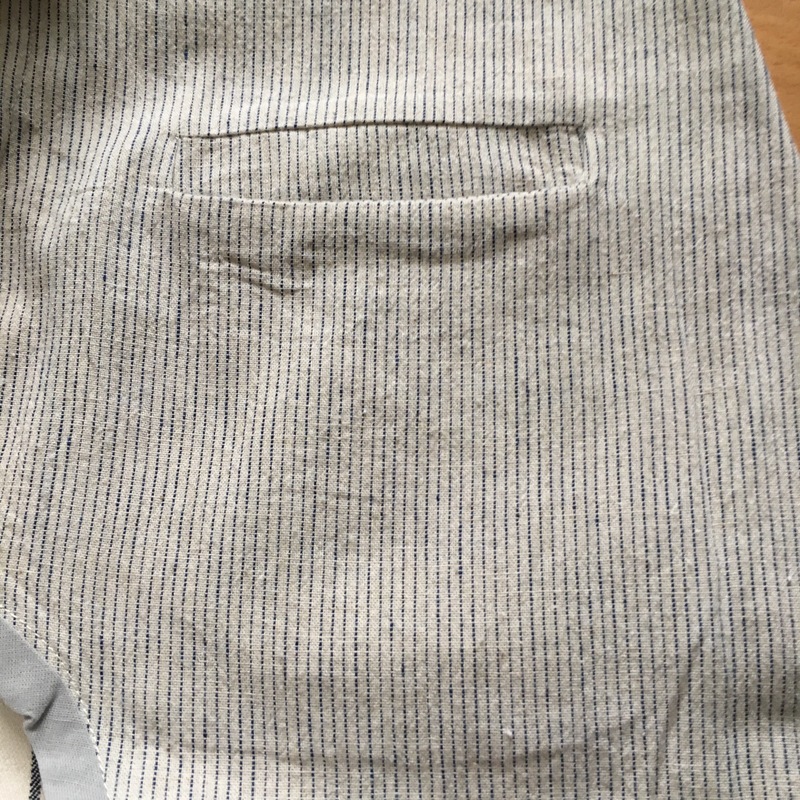 I’m starting to see the ‘joy’ in hand stitching, but I find it very difficult to put a garment back under the machine once it’s finished. 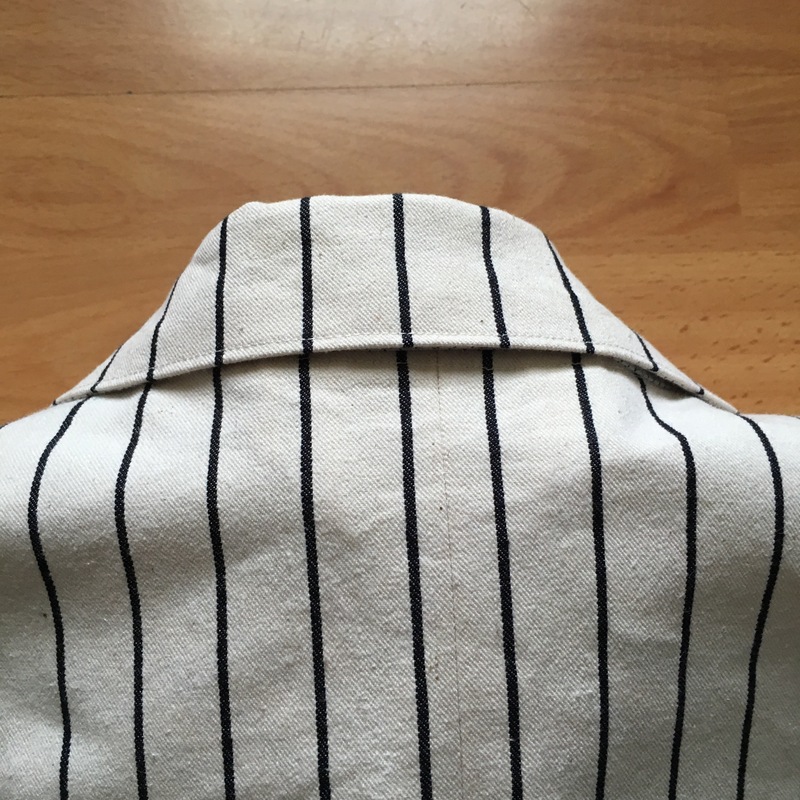 I recently added a top button and buttonhole to my favourite pyjamas… It was a milestone moment. The sleeves went in ok. A bit puffy, but ok. I’ve read about using a little bit of rolled up fleece inbetween the seam allowance as a sort of mini-shoulder pad. I think this would probably help, but I didn’t use any interfacing for the whole jacket; I wanted to wash and wear it like a denim jacket. It was pretty clear from quite early on that this wasn’t the kind of jacket I would buy if I saw it in a shop (I did recently see it in a shop in fact, French Connection, and I can assure you I didn’t buy it). But I don’t dislike it. In fact, I love it. I’d describe it as the kind of jacket Bert wore in the fantasy-chalk-drawing-scene from Mary Poppins. And that’s kind of how I feel when I’m wearing it. Nice. In fact, not to brag, but, I wore it to a birthday party not so long ago and the first three people I saw came up to me to say ‘nice jacket’. Cool huh?! I’m a bit ashamed of the pockets. I wish I’d just used the plain white for the welts, because there wasn’t a cat in hells chance of me matching the stripes, especially with the dart in the middle. If anyone’s having a really close inspection, I keep my hands in my pockets! And overall, I’m very happy with it. I’m particularly happy with how it’s made me wear a jacket I wouldn’t normally wear without feeling like I’m dressing up. It’s very difficult for us home-sewing guys to not end up looking like Cam from Modern Family! So there’s my summer jacket! 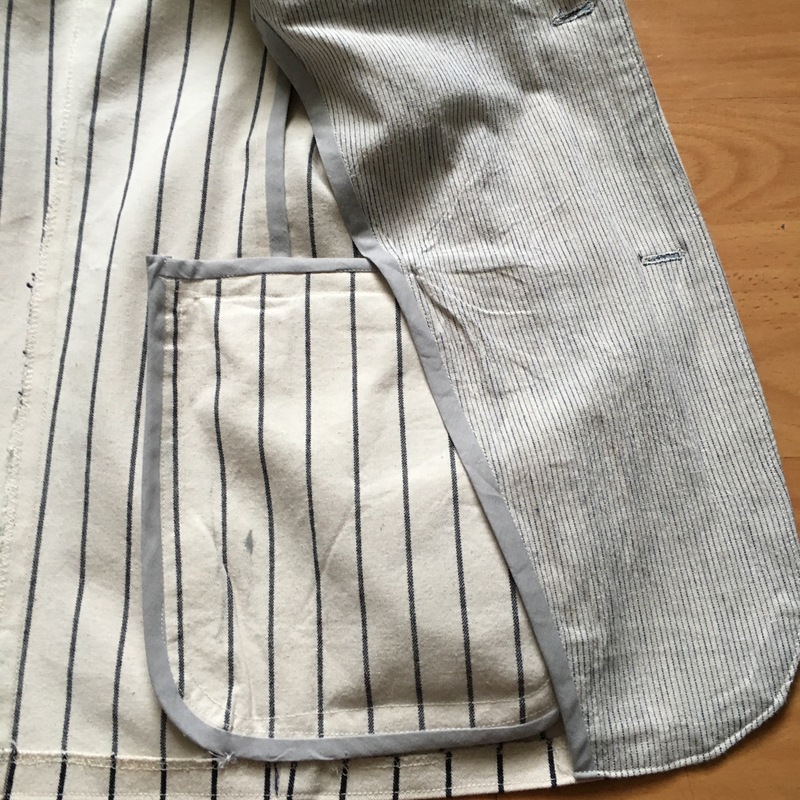 Next time make a lining. Try the fleece shoulder roll thing. Think long and hard about how the pockets are going to turn out. Don’t hide behind wash n wear, try something fancy next time! I really like it. Any pictures of you showing it off? I’ll see if I can find one, or I’ll take one once the weather improves!